I’m not traditionally a headset person. I have always despised the telephone for being a monoaural device. Using only one ear makes me feel like I’m using one side of my brain, and conversations require both. Hence, I never enjoyed using any phone until I got my iPhone and was able to make calls with the Apple In-Ear Headphones with Remote and Mic. It probably doesn’t say much for me, that I require twice as much of my brain to enjoy a conversation as most people, but there you have it. Add to that the discomfort and poor audio quality I’ve found in the average headset in the past, and it has kept me from ever using one longer than the ten or fifteen minutes it took to test it out. Despite my own personal limitations, when I had the opportunity to review the Callpod Vetro Bluetooth headset for MyMac, I jumped at it. 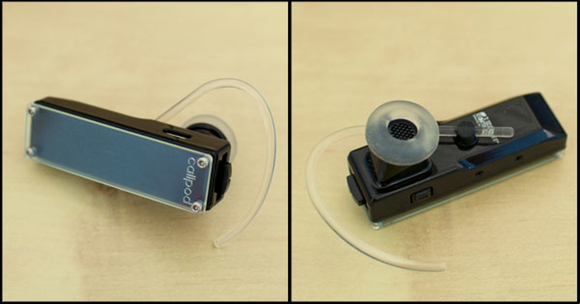 Callpod’s web site displays the Vetro as an elegant headset featuring comfort, style, and range. It looks slick, and I’ve learned over the years that it’s not a sign of intelligence to write any technology off forever based on past experience. Technology changes and improves. For example, with any of the Callpod headsets, you can establish communication with another Callpod headset in walkie-talkie mode, bypassing the phones entirely if you are in Bluetooth range of each other. I was interested in finding out how far Callpod had moved things along for Bluetooth headsets in other ways with the Vetro. 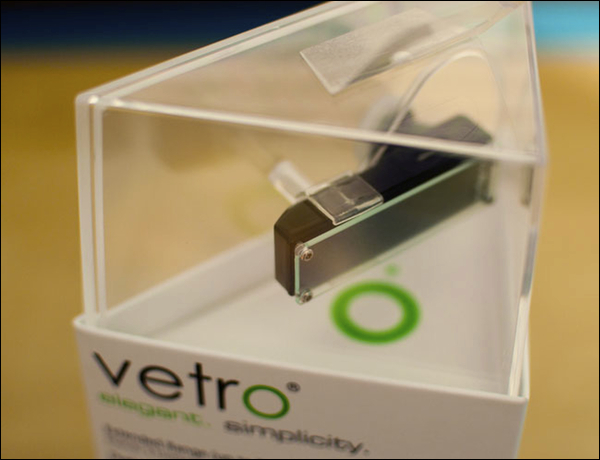 The Vetro comes in a triangular box featuring the Vetro itself displayed in a clear plastic section on top. The box also contains a manual, a soft travel pouch for the headset, AC wall charger, USB charger, and car charger, as well as a replacement earhook and GummyGel earbud. The headset is rectangular with slightly rounded edges. Both Callopod’s web site and Google Translate show that Vetro means glass in Italian. The Vetro features a transparent rectangle attached to its outer face by four screws which is intended to look like frosted glass. It’s actually plastic, and probably won’t fool most people. 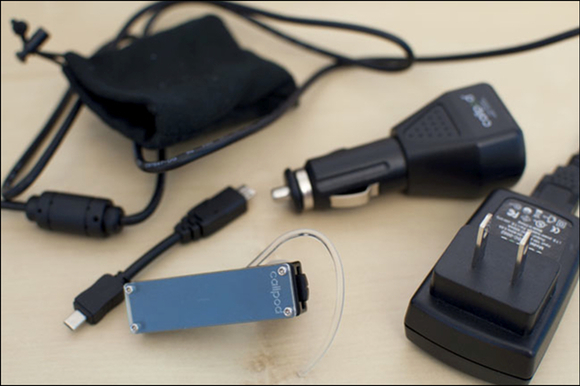 The Vetro’s other main features are a rotatable earhook, an earpiece covered by the GummyGel earbud, two noise canceling mics, an LED under the clear plastic cover, a USB charging port, a power & volume switch, and a multifunction button. Powering on the Vetro is fairly simple, in principle. Simply push in the power and volume switch until the red LED illuminates under the plastic cover and an ascending tone sounds. In practice, I found that when wearing the Vetro on my ear, it often took a couple tries to get the device to power on or off. It seems if you rotate the button even slightly when you press it, it doesn’t work. Since the button is both a power button and a volume rocker switch, it was easy for this to happen. I’ll be the first to admit that I may just be clumsy, but I found it a little annoying that I couldn’t just power it on or off with one click. After powering the headset on for the first time, it needs to be paired with your cellphone. This is done by entering the passcode 0000 on your Bluetooth device when it detects the Vetro. On my iPhone, I found this worked as expected, and that the headset and the phone paired immediately after performing the procedure. Once the pairing has been completed, the fun begins. The Vetro’s calling functions are controlled by the multifunction button. The multifunction button is on the top of the unit when it is worn on the right ear, and on the underside of the headset when worn on the left ear. This single button can be used to place a call with voice dialing, answering or ending a call, muting the mic, or rejecting a call. It can also be used to open a channel between two Callpod Bluetooth headsets when they are used in walkie-talkie mode. Unfortunately, the multifunction button is also one of the Vetro’s greatest downfalls. It’s basically a small cutout with a ridge, and it’s part of the Vetro plastic cover itself rather than being a completely separate physical button. Because of this, there is no tactile feedback. Whenever I pushed the button to initiate a call, I had about two seconds of wondering if anything was going to happen before I would see the voice command screen appear on the iPhone. That was the only way I was able to tell that I had indeed pressed the button such that the Vetro was launched into action. Similarly, when hanging up a call, the only real indication of success was from the beep in the headset and then the call being discontinued on the iPhone. I didn’t see any delay between pressing the button and the call ending, which helps greatly, but the lack of tactile feedback and the rather odd decision by Callpod to design the button this way still causes me wonder. Generally speaking, the headset will be in the ear when this button is used. This necessitates good feedback that tells the wearer immediately that their button press was successful. In my opinion, the Vetro does not provide this. Call quality with the Vetro is mixed. Volume is adequate, and volume adjustments are simple, although it’s necessary to remember that the direction you want to push the volume button is reversed for left ear wearing. This is not unusual for Bluetooth headsets, so it’s not a big deal. The problem I found with call quality was that there seemed to be quite a bit of hiss, even with a fully charged battery. I compared the sound quality to my wife’s Jabra Extreme, and found that with her headset there was much less hiss. It sounded to my ear as if this was because the higher frequencies were being filtered. The impression I was left with is that Callpod left more of the frequency range in, and decided that the resulting increase in hiss and noise was acceptable. Everyone has different tolerance levels for audio noise, so I think this is going to be a fairly subjective issue. Personally, I found it annoying enough that I wouldn’t want to hear it for very long. There are no adjustments that can be made regarding noise or hiss, just are there are not for competing Bluetooth headsets. Worse than the static was the feedback I received from people on the other end of the call. Several told me that I was cutting out and that they had trouble understanding the occasional word or two. I also found that a couple of times, I heard cutting out on the other end as well. While static and fuzzy sound is a minor annoyance, cut outs and requests to repeat sentences are not minor. For business use, this would become a problem rather quickly. As far as comfort and fit are concerned, the Vetro feels slightly large and blocky next to the face, but not unbearably so. However, the earpiece is really nice in my opinion. The Gummy Gel earbud feels very large and initially uncomfortable going into the ear. As it takes the shape of the ear, however, it not only becomes comfortable, it also helps the earbud feel secure and helps isolate external noise. I found it much more comfortable for long term wearing than any other Bluetooth headset I have worn. I’m sure this will be another subjective aspect of the Vetro, as everyone’s ears are different, but I found it quite to my liking. The Callpod Vetro is clearly aimed at providing competition to the popular Jabra and Jawbone lines of Bluetooth headsets. It partially succeeds by providing ease of use, features, and comfortable wearing, but falls short in sound quality and tactile feedback. If these two issues are addressed, Callpod may have a winner. Until then, it’s hard to recommend this Bluetooth headset for the price.